Who isn't delighted by watching the myriad of color changes as you slowly turn a kaleidoscope? Spring sunshine is perfect for enjoying multi-colored beauty and we love this mini quilt from RJR by Cherie Grzych! 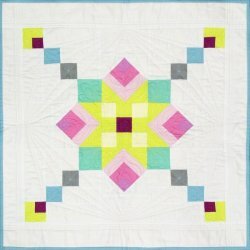 This is a great project for any level of quilter, and the instructions are easy to follow. Enjoy!